Frequent goers of specialty fairs and weekend markets in Makati may be familiar with Pizza Morena, a rustic, wood fired pizza concessionaire. Its origins go back to 2012 when it started out as a humble stall in the Balik Bukid fair in Sta. Elena, Laguna. “When we were selling about 300 pizzas per day in one event, we were like ‘okay, I think we’re on to something,’” expressed Jenny Diaz, founder of Pizza Morena. This success gave her the go signal to expand to the big city and was well-received by loads of hungry customers. It was just recently when they opened up a permanent home in The Corner Market Food Hall in the Podium. On coming up with the name ‘Pizza Morena,’ Jenny explained that she has always been drawn to images of strong and independent women. A photo of a Waraynon woman with a dangling cigarette on her lip inspired her to arrive at the name morena. ‘Accidental’ was how she described her homegrown brand’s concept. “I became a single mom and that’s how the whole branding started to develop because it became such a huge feminist angle,” she revealed. And true enough, when I visited the stall during their launch, I was captivated by the overtly feminist artworks situated on the wall. 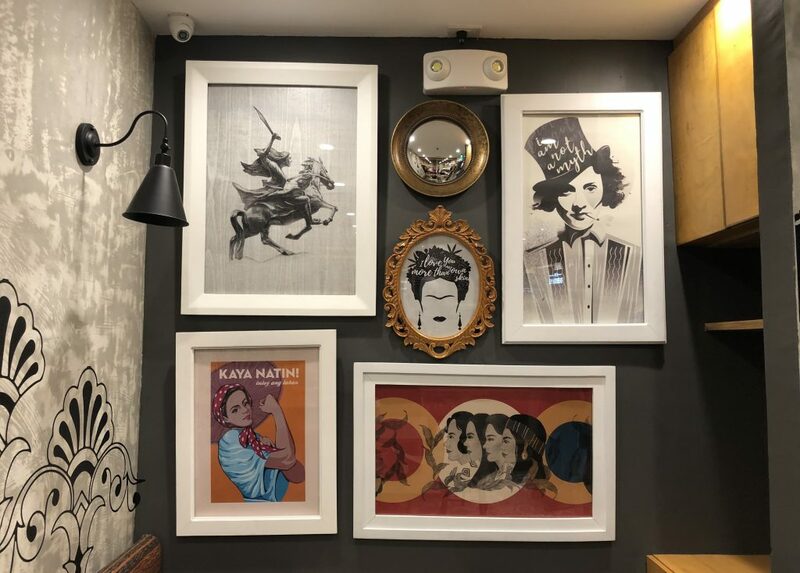 Paintings of local and foreign female icons such as Gabriela Silang, Frida Kahlo, and Filipinized versions of Rosie the Riveter and Marlene Dietrich graced the walls. Doughs are carefully shaped by hand before they are baked in an open-fire oven. The pizza needs to be constantly moved so that each side is baked. 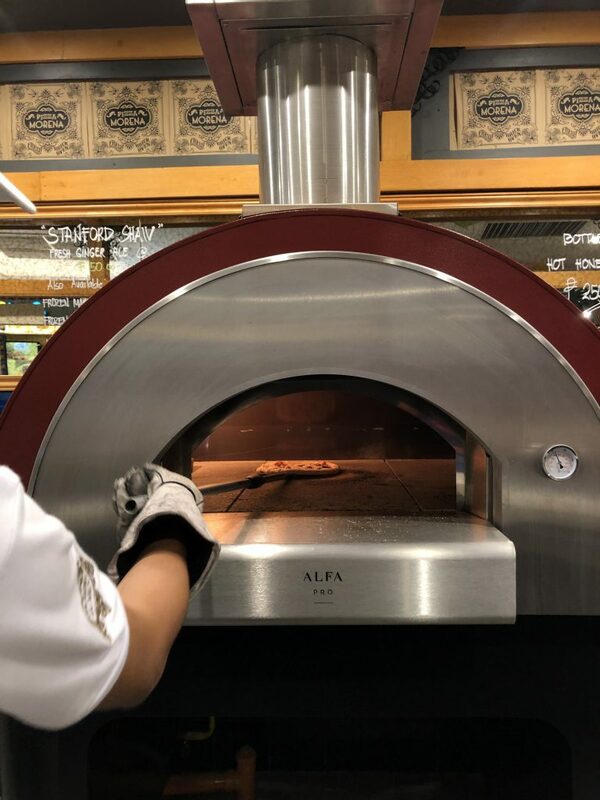 Pizza Morena offers three kinds of pizzas: regular (cooked-to-order pizzas using unbleached wheat flour), gluten-free, and frozen (which can be gluten-free, as well). Their pizzas are served with fresh ingredients both from here and abroad. Their burrata cheese and microgreens, for example, are sourced from a local farm. The signature pizza is a crowd favorite. Flavors of different cheeses such as mozzarella, mascarpone, and parmesan delighted my palate. 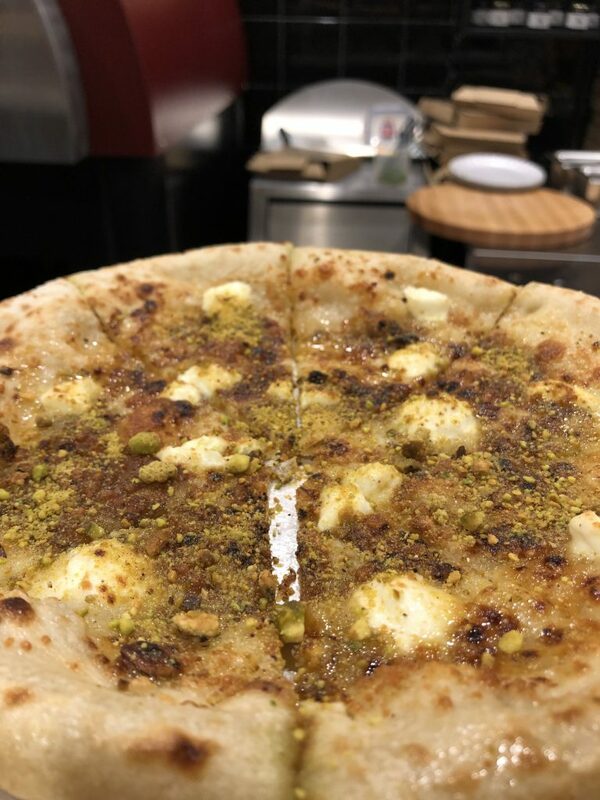 To top it off, the pizza is drizzled with a generous amount of pistachios, truffle oil, and honey to give it a sweet-savory balance. For vegetarians, try their spinach and artichoke variant. It has a creamy spinach base composed of mozzarella, parmesan, artichoke, and olive oil. 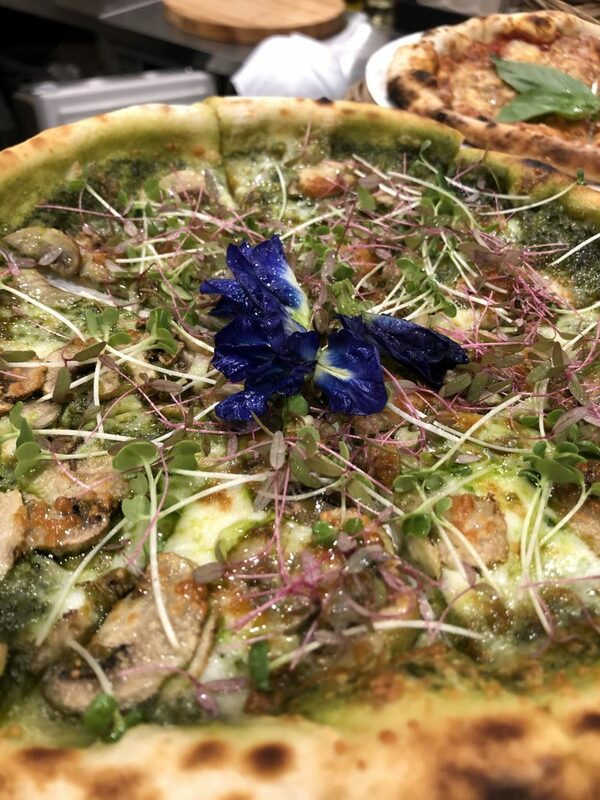 The top is sprinkled with microgreens and garnished with edible flowers. Although the toppings make the pizza look overwhelming, it’s incredibly light on the stomach. 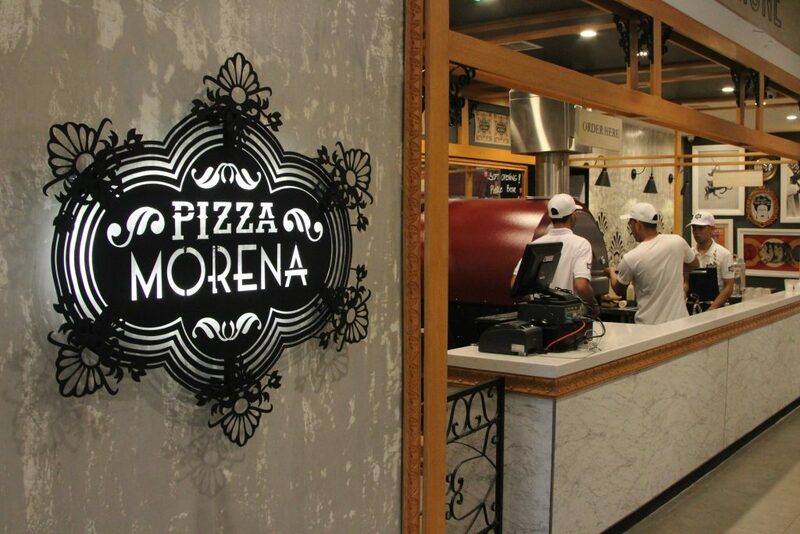 Pizza Morena is open everyday from 11 a.m. to 10 p.m. at the 2nd floor of the Corner Market Food Hall, The Podium Mall, Ortigas Centre.